Personalized Rosewood Pen and Pencil Sets Custom Engraved in Bulk. Promotional, Very Inexpensive. Budget Prices in America. Shipped in Rosewood Gift Box with optional Custom Engraving. 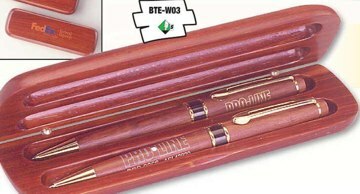 Basic unit price includes laser engraving on both pen and pencil. Engraving on the gift box, size 3" x 1", is extra: add $1.90 per set. Estimated Production: 7 days after art approval; rush production is available: contact us. Splendid Rosewood "Mont-Blanc" style pen with gold plated trims. Fine point for distinguished writing. Blue or black ink, twist action with metal Cross type refill. Matching Rosewood Mechanical Pencil with gold plated clip. Laser engraving on both Pen and Mechanical Pencil. Color: Rosewood with Gold trim.